Since you were interested in New York City activities . . .
James and I rode bikes down to the Brooklyn shore for his birthday recently. 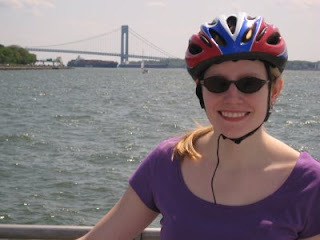 Here I am with the Verrazano-Narrows bridge (the one for which I crashed the Marathon). 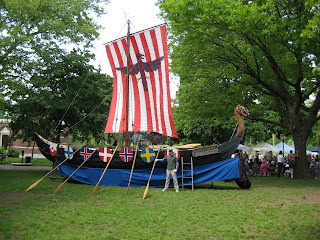 On that same jaunt, we randomly found a Norwegian festival in a Bay Ridge park. Here James poses with a Viking ship. 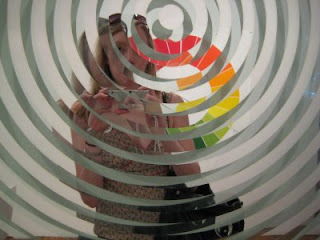 Self-portrait in a multilayered mirror, taken at the Olafur Eliasson exhibit at P.S. 1 last Saturday. I highly recommend both that exhibit and its MoMA half for beauty, simplicity, and elegance. It's closing soon, so go! Go! Finally, Angela Gheorghiu performs in Prospect Park in Brooklyn last night as part of the Metropolitan Opera's "Met in the Parks" program. 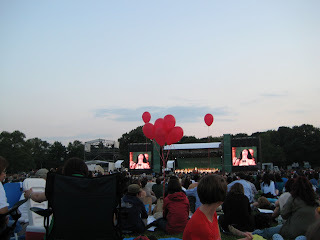 It was a gorgeous evening, 75 and sunny, and New Yorkers covered the south end of the Long Meadow to picnic and see Ms. Gheorghiu, her husband Roberto Alagna, and the Met Orchestra and Chorus perform selections from The Pearl Fishers, La Traviata, Il Trovatore, Nabucco, and others. After a ten-song program, the couple did, I think, eight encores, which was a bit much -- but as they included "Nessun dorma" from Turandot (surely one of the most beautiful pieces of music ever) and "O Sole Mio" from Trovatore (yes? they also turned it around and sang "It's Now or Never" by Elvis, which, I had never realized, uses the "Sole Mio" melody), I cannot complain.